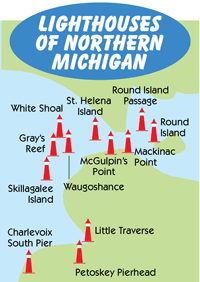 About 30 miles south of Big Sable Point Lighthouse brings you to the other "point," located in the Silver Lake State Park at the Silver Lake Sand Dunes. Little Sable Point Lighthouse is a 107' brick structure, constructed in 1874. Along with Big Sable Point Lighthouse, this structure is one of the tallest in the state of Michigan at over 100 feet and 130 steps to climb the tower. 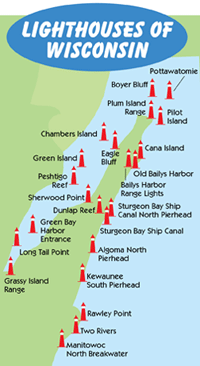 The Sable Points Lighthouse Keepers Association maintains the lighthouse, and it is open for tours daily from 10am-5pm May 27 through September 25, 2016. 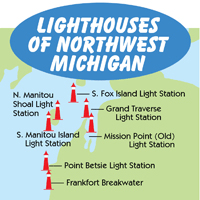 There is a $5 donation fee to climb the lighthouse tower; $2 for children 11 & under. Due to weather conditions and staffing, it may be wise to call ahead at (231) 845-7417, or visit www.splka.org for more information. 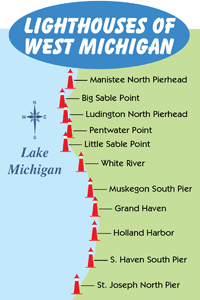 Take US-31 to the Hart exit, take Polk Road, west to 56th, south on Fox, west to 34th, south to the Silver Lake Sand Dunes, through Silver Lake past the State Park, then follow signs to the lighthouse. New to the park is a ten foot wide paved pathway that leads from the parking lot to the lighthouse. This now allows those with physical disabilities and those in wheelchairs to access the base of the lighthouse. Originally named Petite Pointe Au Sable, it cost $35,000 to build and contained 3 rooms. The rare third order Fresnel lens emitted a constant white light, and flashed a brighter light at set intervals, visible 19 miles into Lake Michigan. The early 1900s saw some changes to the lighthouse. In 1900 the tower was painted white, and an access road and storage building were added in 1902. The name was changed in 1910 to Little Sable Point Lighthouse, meaning "little point of sand," representing its location which juts into Lake Michigan. In 1977, the tower paint was removed and the original brick exposed. Over the years, the lighthouse has had 15 keepers; and for one month, a woman took over when the original keeper took a temporary leave. The Sable Point Lighthouse Keepers Association took over the maintenance of the lighthouse in 2005, and it is open to the public from late May to late September. 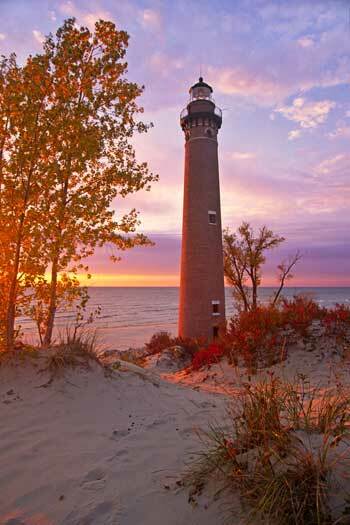 Located on Little Sable Point (Lake Michigan) in Silver Lake State Park, near Mears, Michigan. Go to the end of Silver Lake Road look for the lighthouse parking lot. This is an excellent swimming beach and Lake Michigan produces some great sunsets. The parking lot has close to 200 spaces but during nice weather will most likely be filled by beach users. 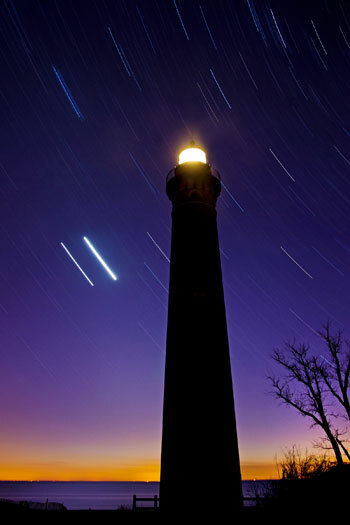 The Little Sable Point Lighthouse is part of a Michigan State Park, and an entrance fee is required. Part of the fee helps preserve the lighthouse. Harbor Point Lighthouse -- Located in Harbor Springs in Northern Michigan. McGulpin Point Lighthouse -- This lighthouse is located in the Straits of Mackinac at Mackinaw City. Old Mackinac Point Lighthouse -- Old Mackinac Point Lighthouse is in Mackinaw City.